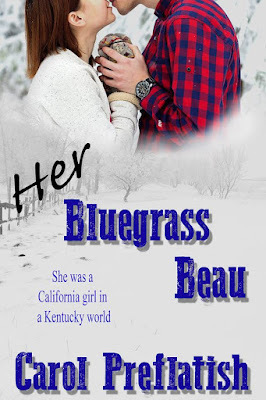 "Her Bluegrass Beau" is author Carol Preflatish's seventh romance novel and her favorite one so far. "I like to write about locations that I'm familiar with and while I'm not from Kentucky, it's one of my favorite places to visit." "Her Bluegrass Beau" is about Karri Taylor needing to get out of California and away from her ex-boyfriend. She couldn't think of a better time to visit the Kentucky farm she inherited from her great-aunt. Jake Duncan is the definition of a perfect southern gentleman and it doesn't take long for Karri take an interest. From helping him nurse his sick horse back to health to meeting the neighbors, she develops an affection for both Jake and the many attributes of the Bluegrass State. Her plan was to sell the farm and head back home, But, when a blizzard hits, the plan changes. She's stranded at the farmhouse until Jake comes to the rescue. With the lack of enough food and discovering the generator stolen, the only thing she can do is accept Jake's offer to stay with him until power is restored. During her time with Jake, she learns that a big company is trying to buy all the farms in the area, against the wishes of the neighbors. She's torn between selling her farm and going back home where she owns a business or stay in Kentucky and start all over with Jake by her side. Carol Preflatish lives in southern Indiana and shares a log cabin with her husband and two cats in what seems like an enchanted forest with a menagerie of wildlife constantly visiting. A few little-known facts about Carol are that she's a licensed amateur radio operator, has a degree in Physical Education, and is a collector of golf balls, shot glasses, and coins. Carol is a member of the Sisters in Crime organization and Kentuckiana Authors. umbrella behind the door and picked it up. It would have to do. Standing on the other side of the door was Jake, the neighbor she met last night. "Good morning,” his frosty breath floated upward as he spoke. "What do you want?" she said, still not opening the door. "I brought you some coffee and biscuits with sorghum. Can I come in? It's kind of cold out here." especially since her bare feet were freezing. She opened the door to let Jake inside and pulled her light robe around her. She shivered when the cold air hit her skin. it. More rudeness, she thought. She put the umbrella back and followed him to the kitchen. aluminum foil. When he unfolded it, she saw it had butter inside. "You think of everything, don't you?" "Sugar is fine." She went to the cabinet and got some plates and cups. After rinsing and drying them, she brought them to the table. Jake got silverware from one of the drawers and placed them on the table.